I believe the number one reason a salesperson oversells is his or her fear of rejection. It doesn’t take a genius to recognize when a prospect is sold on the product, and I give the average salesperson credit for knowing that. Sadly, the guy is just too scared to close the sale because he doesn’t want to ruin a relationship that he perceives has blossomed into a beautiful friendship. The typical salesperson is under the false impression that by attempting to close the sale, the prospect will be put on the spot and will say no—even worse—become offended by what could be interpreted as high-pressure selling tactics. So rather than risk facing the moment of truth, the salesperson continues to sell when he should shut up. Over selling is self-defeating because it undermines what otherwise would have been an effective sales presentation. The salesperson’s lack of confidence is contagious, and the prospect soon becomes leery and suspicious of making a buying decision. His mental gymnastics is: “Why does this person continue to sell me when I already want to buy? There must be something he’s trying to cover up”. As a result, the more the salesperson sells, the smaller his chances of closing. For starters, you don’t have to present every fact you know about your product to sell it. Likewise, it isn’t necessary for your prospect to become an expert on it before he can make a buying decision. 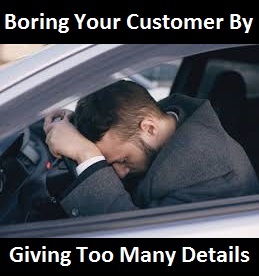 The way some people sell, they must think it’s mandatory to explain every detail of their product—and by gosh, they refuse to let anyone buy until they do! I’ve witnessed salespeople go through their complete sales presentation, make an attempt to close the sale, and before the prospect could say, “Yes, I want to buy,” they went into windy explanations of trivial facts that created total havoc. Talk about overkill! Then there are others who think a sales presentation isn’t complete until they’ve sufficiently impressed a prospect with their vast product knowledge. They oversell until their prospects are bored to tears. These salespeople walk away feeling superior, but with empty order pads. Both types talk their way out of more sales than they close. I’m not suggesting that you shouldn’t be an expert in your business YOU SHOULD. No field is so complicated that a salesperson should be excused from knowing his or her business backward and forward. But you must execute good judgment and know how much information to give which prospects. Keep in mind that there are always exceptions. Some seemingly unlikely prospects are interested in technical details, and if so, you must be prepared to fill them in on the information they request. You must size up your prospects and custom-make your sales presentations to their interest. Once you’ve asked for the order give your prospect enough time to think about the decision, don’t interrupt his or her train of thought. There’s a reason SILENCE IS GOLDEN. Once you’ve given your remarks or explained what you have to offer STOP TALKING. The less you say, the better chance you have of closing the deal and locking up the opportunity!